very nice quality, makes the home look so much nicer when you walk by them in the hallway.. This stunning 2-light Crystal Wall Sconce Light only uses the best quality material and workmanship ensuring a beautiful heirloom quality piece. Featuring a radiant Chrome Finish and finely cut Premium Grade clear Crystals with a lead content of 30-percent, this elegant wall sconce will give any room sparkle. Dimensions 6.0 In. X 6.0 In. X 13.0 In. 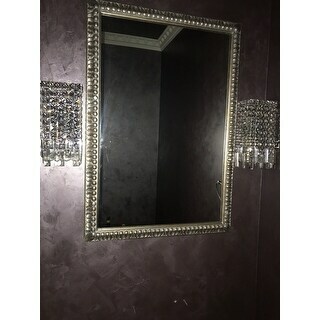 I purchased 3 of these to coordinate with the French Empire Collection 14 light Chrome Finish with Clear Crystal Chandelier 20" x 26" because the bottoms of the sconces have the same crystal balls, so they match well. They have incandescent bulbs, so they are dimmable, and they install easily. The trade off in price it is completely assembled by your installer, save for the frame. All the crystal strands have to be linked together, whereas a more expensive light might have them partially assembled. If you can tolerate that, it's a good buy. The crystal in my sconces tended to be more of a white fire, so the colors aren't as brilliant as the chandelier, however, they are still eye-catching and will add a touch of glam-sophistication. These fixtures are absolutely beautiful! Quality construction, beautiful crystal and they give so much gorgeous light. Elegant ! It is such a gorgeous crystal light as shown in the picture on the website. 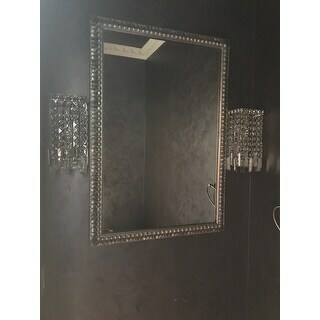 It is such a perfect piece for decorating my powder room. Delivery was really fast. All items were well packaged and arrived without any damage. We really didn't have to rely on the instruction cause it is just a straightforward process while putting things together. There was extra pieces available which was a plus. 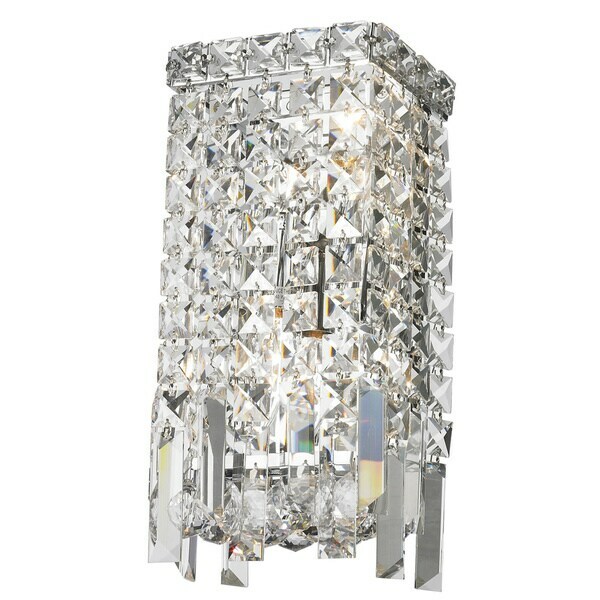 I definitely recommend this crystal wall scone light to anyone who loves to have a little bit of glam in your house. This sconce is simply lovely. The crystals/glass are bright and clear. I'm very happy with it. these lights (I bought 2) are a perfect accent for my bathroom remodel. Brings a lovely amount of sparkle to the room. The only surprise was they had to be assembled. these are perfect for my rustic fireplace and mantel..... the fixture is gorgeous no matter where you put it... get compliments all the time. Beautiful and fairly easy to hang the crystals. "I want to purchase two of these fixtures. Can they be used on a dimmer switch"
This fixture can be installed to be dimmable by a professional electrician. We suggest using compatible dimmable bulbs. "What is the actual width of the fixture?" Hello laurie, the actual dimension of the wall sconce is 6 inches wide x 13 inches high with a 4 inch extension from wall. Thank you for shopping with us. "What is the height of this sconce? The details don't specify." Hello Toby L., this is approximately 13 inches high. Thanks for shopping with us!